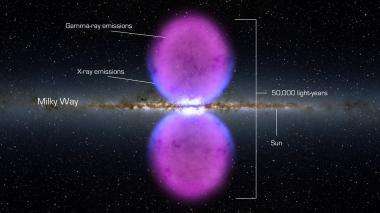 (PhysOrg.com) -- NASA's Fermi Gamma-ray Space Telescope has unveiled a previously unseen structure centered in the Milky Way. The feature spans 50,000 light-years and may be the remnant of an eruption from a supersized black hole at the center of our galaxy. "What we see are two gamma-ray-emitting bubbles that extend 25,000 light-years north and south of the galactic center," said Doug Finkbeiner, an astronomer at the Harvard-Smithsonian Center for Astrophysics in Cambridge, Mass., who first recognized the feature. "We don't fully understand their nature or origin." Finkbeiner and Harvard graduate students Meng Su and Tracy Slatyer discovered the bubbles by processing publicly available data from Fermi's Large Area Telescope (LAT). 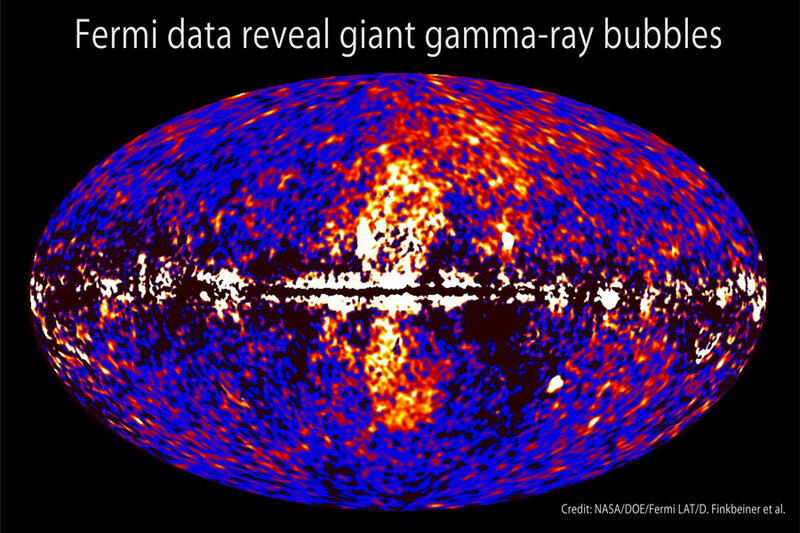 The LAT is the most sensitive and highest-resolution gamma-ray detector ever launched. Gamma rays are the highest-energy form of light. Scientists now are conducting more analyses to better understand how the never-before-seen structure was formed. The bubble emissions are much more energetic than the gamma-ray fog seen elsewhere in the Milky Way. The bubbles also appear to have well-defined edges. The structure's shape and emissions suggest it was formed as a result of a large and relatively rapid energy release - the source of which remains a mystery. The bubbles display a spectrum with higher peak energies than the diffuse gamma-ray glow seen throughout the sky. In addition, the bubbles display sharp edges in Fermi LAT data. Both of these qualities suggest that the structure arose in a sudden, impulsive event. Credit: NASA/DOE/Fermi LAT/D. Finkbeiner et al. 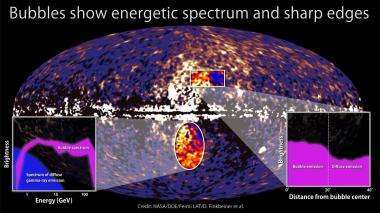 The Fermi LAT team also revealed Tuesday the instrument's best picture of the gamma-ray sky, the result of two years of data collection. "Fermi scans the entire sky every three hours, and as the mission continues and our exposure deepens, we see the extreme universe in progressively greater detail," said Julie McEnery, Fermi project scientist at NASA's Goddard Space Flight Center in Greenbelt, Md. NASA's Fermi is an astrophysics and particle physics partnership, developed in collaboration with the U.S. Department of Energy, with important contributions from academic institutions and partners in France, Germany, Italy, Japan, Sweden and the United States. 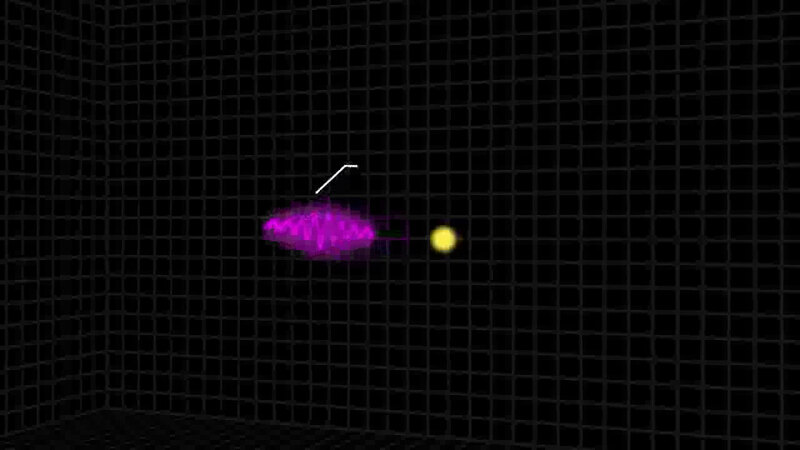 "Since its launch in June 2008, Fermi repeatedly has proven itself to be a frontier facility, giving us new insights ranging from the nature of space-time to the first observations of a gamma-ray nova," said Jon Morse, Astrophysics Division director at NASA Headquarters in Washington. "These latest discoveries continue to demonstrate Fermi's outstanding performance." I thought the emissions from the axis or poles of a rotating black hole (BH) have been known. Surely the cause is the core BH swallowing a massive galactic scale object and emitting a plume of particles out of the poles. Those familiar with laboratory plasma physics will recognize the bipolar morphology of the pinch. That people continue to be surprised by it plainly suggests that people are ignoring the fact that 99% of what we see in space is matter in the PLASMA state. Check your assumptions at the door, because this is to be expected within an ELECTRIC universe. ^ Is that a new Zephir? Maybe better now? Although I'm quite sure those numbers are not very accurate either, but that was not the point.. Neutrinos are not the end of this equation nor is the universe the beginning of this equation. Not really an equation - but more like a concept - like fractal universe. However, the "universe" bit of it needs to be properly defined (localized) before it can be written like that. Saying "the universe is not everything" is just logicaly incorrect. Looks like a poorly made photoshop fake to me. What would a really well done photoshop look like? Surely the cause is the core BH swallowing a massive galactic scale object and emitting a plume of particles out of the poles. No. Neutron repulsion [http://db.tt/yxaIAGN] prevents the formation of black holes. Neutron repulsion powers the Sun [http://db.tt/wj4lCR3] and the cosmos. It causes fragmentation of heavy nuclei, stars and galactic centers. Jets are also reported from the poles of neutron stars. The notion of a Black Hole (BH) should not discount other theories. I'd suggest this is two giant plasma states spinning in opposite directions and resisting fusion. Gravity accounts for the spiral Milky Way Galaxy's centripetal form. There are many surprises about our cosmos yet to be revealed and understood. I would think of jet remnant and or combined with aurora on steroids, spinning galaxies as a whole can have magnethospheres and one could expect charged particle collisions near the poles, especially if there was already an old gas plume fromk a burned out quasar to be lit again, whether that turned into BH or a neutron star as Manuel postulated. I wonder if it is a common effect. I understand that it evaded observation in our own galaxie by being shrouded and drown in the statistic noise, but own would expect to reveal such phenomena more easier on viewing other galaxies from the side? or do again statistic filtering have to be tweaked again to reveal our new reality? What's so confusing about a former quasar or is our super massive black hole the only one in the universe that didn't emit massive amounts of energy? H-bosons atto L-bosonic Away until Milky, means no real bubbling from. No. Aether and electric universe are diametrically opposed. Zephir wouldn't preach electric universe. Not really an equation - but more like a concept - like fractal universe. Since it came up, the fractal universe idea is just about the dumbest idea I've ever heard of. The reason for this is because we've discovered that fractals cannot innovate. Sure they look different from one to another however in their basic function and calculation there is very little variance in the basic construction of the item. Fractal objects cannot evolve, they're locked into an infinity of sameness. I don't think fractals would ever be an apt or descriptive model of the Universe, or multiverse depending on your preferred terminology. Neutrons do not repel, they decay. They do not repel on decay. 2. "Attraction and repulsion of nucleons: Sources of stellar energy", J. Fusion Energy 19, 93-98 (2001). 3. "Nuclear systematics: III. The source of solar luminosity", J. Radioanal. Nucl. Chem. 252, 3-7 (2002). 4. "Neutron repulsion confirmed as energy source", J. Fusion Energy 20, 197-201 (2003). 5. "The structure of the solar core", Proceedings of the Fourth International Conference on Beyond Standard Model Physics - BEYOND 2003 (IOP, Bristol, editor: H. V. Klapdor-Kleingrothaus, 2004). etc., etc. 6. "The Sun is a plasma diffuser that sorts atoms by mass", Physics of Atomic Nuclei 69, 1847-1856 (2006). IMO the galaxies condense and evaporate in infinite universe like giant density fluctuations of dense gas. At their beginning they're forming spherical fuzzy quasars/naked singularities/white holes, which condense and evaporate their matter into radiation. When most of matter is evaporated, the white hole will change into dark collapsar with exception of polar jets, where event horizon is not fully closed yet. These jets are behaving like giant fountains, which transform galaxy into its typical flat shape. When all excessive matter is evaporated, the central collapsar will change into calm black holes and the gallaxy will change into red elliptical galaxy. I presume, the most lightweight particles, like the positrons and (anti)neutrinos are emanated from poles of collapsars for longest time, so we can see their evidence even by now. Actually we should detect such clouds around most of galaxies of medium age. A note to HannesAlfven: I have waited 30 years for someone to express your insight into the metaphysics of reality. Finally a general independant duplicity of conclusion. As I surmise you already know, such insight opens the way to the correlation between the scalar differentials of matter, vortice & dark energies, and the co-planar phase differentials of probability within infinite existance. This Gamma projection discovery is sure to open a few doors. When differential probabliistic limits of relevence and significance replace our tendancy toward convenient, finite absolute constants, the new model will mark an epoch of synergistic dimensions. I hope to see a more elegant, realistic myopia of the standard model in my lifetime thanks to like propagations and opinions. "No. Aether and electric universe are diametrically opposed. Zephir wouldn't preach electric universe." That's not entirely true. The concept of Aether was ruled out by Einstein's theories alone. The EU doesn't draw lines like he did, and the concept of Aether is still under consideration- one concept being a sea of neutrinos in their most collapsed form, which would allow waves to propagate across space. Anyway, the 'bubbles' of our galaxy with 'defined edges' will eventually resolve into the shape of an hourglass. The bubbles are where the Z-pinch is occuring in the dusty plasma filament that powers our galaxy and are entering a discharge mode due to the increase in current density. That last bit is my thesis, at any rate. It stands to reason this will prove true since we see it occur with planetary nebulae, which are smaller versions of galactic pinches, and plasma phenomena are entirely scalar. Zephir wouldn't preach electric universe. Many insights of this theory aren't still wrong with it. For example, I'm assuming, the clouds of dark matter are formed with positrons, which are held together with their electrostatic forces at distance against gravity. The newly found clouds around our galaxy could keep their shape in the same way. The balance of repulsive electrostatic forces and attractive gravity is the equilibrium, which has been ignored in most of cosmological models - and it's still completely classical model, which doesn't violate anything, what we know about Universe. Are you familiar with electric universe theory, or are you jsut trying to pump aether on me? No, actually they can't. If you don't have a grasp over the words I'm using, Zephir, feel free to ask for clarification. What did the hydrogen atom innovate in the last 14 billion years? facepalm... What is the structure of a hydrogen atom, is it the only structure that those subcomponents can be organized into? Is there a constraint beyond the physical rules that precludes suitable subsequent arrangements? And to answer your question as you asked, Helium. Hahaha! In your opinion the fractal universe is just about the dumbest idea you've ever heard of. No, it is simplistic and inaccurate when compared to observation. Aether is the dumbest idea I've ever heard of. Go sit by the garbage. No thanks, but I'll take your pet theories out there as I pass by. Haha! Fractals cannot innovate? What did the hydrogen atom innovate in the last 14 billion years? Hahaha! In your opinion the fractal universe is just about the dumbest idea you've ever heard of. Go sit by the garbage. Ps. When particles decay where do you think the product goes? It radiates away from the particle (radiation). Radiation repels. Not sure if you are aware, probably not, the universe is expanding at an ever increasing rate. All particles are repelling energetically, while mass draws them together. Electroweak force is decay. Seriously, go sit by the garbage, that's where you belong. You are right. The universe fragments and expands. consumption of one star could produce this sort of thing. The accretion disk plane does not have to match the black hole spin, as it would depend on the momentum of the infalling matter. If accurate measure are made it may be possible to tell the energy in the lobs, and how fast it is decaying, to get an idea of the initial energy involved. Hydrogen did not invent helium, nor did it evolve into helium. Stellar nucleosynthesis begs to differ. I've provided no mathematical proof, nor have I technically written the theory out. But you claim it supports and describes everything, including why you're wearing a particular color sock today. Which means it's just ridiculous pedantry. And I give it to you often. how is the structure holding there and not falling back on the galaxy through gravity? 2. "Attraction ...energy", J. Fusion Energy 19, 93-98 (2001). 3. "Nuclear ... solar luminosity", J. Radioanal. Nucl. Chem. 252, 3-7 (2002). 4. "Neutron ... source", J. Fusion Energy 20, 197-201 (2003). 5. "The ... Klapdor-Kleingrothaus, 2004). etc., etc. 6. "The ... mass", Physics of Atomic Nuclei 69, 1847-1856 (2006). B = the total number of "citable items"
The new video on neutron repulsion should be completed and posted tomorrow. The last video showed evidence that the interior of the Sun is composed mostly of Fe, O, Ni, Si, S. Mg and Ca - just like planet Earth and ordinary meteorites. You may want to view it first. 1. Prior to the 50's, space was considered to be a vacuum populated largely with matter in the solid, liquid and gaseous states. Nobody expected that our probes would be barraged with charged particles everywhere they went. Nowadays, nearly every astrophysical textbook starts out in the introduction explaining that 99% of what we see with our telescopes is matter in the plasma state. This should have inspired a dramatic shift in our theories for the universe, and yet it did not. 2. In the laboratory, plasmas within the presence of an electromagnetic field can ignore gravity with less than 1% ionization. 3. We know that space is permeated by magnetic fields. In the laboratory, a sustained magnetic field in a plasma requires an electric current to cause it. 4. Gerrit Verschuur observes interstellar filaments which exhibit the same critical ionization velocities that we see in the laboratory. So long as our scientists and theorists continue to ignore these four fundamental observational facts, in favor of more exotic, hypothetical explanations, the universe will continue to seem mysterious. Anthony Peratt can create a spiral galaxy with perfect rotational characteristics using nothing more than electromagnetic plasmas. Laboratory plasma physicists observe plasma beams to naturally emit (synchrotron) microwaves every day. The CMB can be easily explained with laboratory plasma physics if we fund it. Gerrit Verschuur's papers validate Hannes Alfven's CIV prediction, explaining how it is that the CMB can come at us from all directions. Hannes Alfven -- the very man who helped create MHD -- has distanced himself from treating cosmic plasmas as though their behavior is dictated by gravity. He, for instance, called the frozen-in magnetic field concept "pseudo-pedagogical". People need only open their eyes to the world outside of conventional wisdom to get the big picture. When people claim that plasma cosmology is "dead," they ignore the unassailable fact that IEEE's Transactions on Plasma Sciences continues to fund the research to this day. Plasma cosmology was created by a Nobel laureate, Hannes Alfven. It remains under investigation by a former adviser to the Dept. of Energy and z-machine researcher, Anthony Peratt. Observations which support it and which validate Alfven's CIV predictions have been made by one of the world's premier radio astronomers, Gerrit Verschuur. The universe can be made to work just fine without hypothetical, invisible particles like dark matter and energy. Those who would prefer to imagine what plasmas do, rather than infer their astrophysical behavior from laboratory observations, are not practicing science. There is no philosophy in cosmology or astrophysics anymore. There is only the consensus view, and a complete failure to consider any competing ideas -- and even as those ideas are performing fantastically. There exists a burden amongst conventional theorists and scientists to read about and investigate theories which demonstrate predictive successes. Our scientists and theorists are ignoring ideas which they were not taught in school because they were instead taught assumptions about the behavior of cosmic plasmas which do not support these alternate explanations. At what point do they have a burden to question these assumptions? The answer is at the point of the inferential step in every single peer-reviewed paper published in the astrophysical journal. The notion that we can solve the great mysteries of the universe by assuming just one framework -- the conventional theories -- is in fact a dangerous gamble. There is no philosophy in this approach. This is humans falling in love with the first idea that they learned about. It is not a scientific approach, because science demands a methodology that can accommodate competing ideas which demonstrate predictive capabilities. The average density of the Sun is about 1.4 times (1.4gm/cm3) that of water. Earth has a average density of 5.5gm/cm3. I understand that "iron rain" is a predecessor to stellar collapse. 1) How can the Sun have a core, of any appreciable size, composed of these heavy elements, with such a low avg. density? 2) Is it me, or does your neutron repulsion theory cause (produce) the same measured nuclear by-products as Hydrogen Fusion, 4 1H + 2 e --> 4He + 2 neutrinos + 6 photons? Nobody watched the video and was offended by the incident angle change of the photon? 1.) The solar core is a neutron star. 2.) Neutron repulsion generates solar luminosity, solar neutrinos, and solar wind Hydrogen in the proportions observed. 2a.) Neutron-emission generates ~60% of solar luminosity. 2b.) Neutron-decay generates ~5% of solar luminosity;100% of solar-wind H. 2c.) H-fusion generates ~35% of solar luminosity: ~100% of solar neutrinos. I will post a new video tomorrow, "Scientific Genesis: 3. Neutron Repulsion." Forgive Shootist for not having all the details of your fantasy star's structure memorized. However, since it is generally agreed that the density of a neutron star approaches that of an atomic nucleus, far outstripping the density of the aforementioned heavy elements, you weaseled your way out of answering a question with merit. So here it is again, modified to more closely match your model of the sun. How can the Sun have a core, of any appreciable size, composed of neutrons AND surrounding this core a layer containing heavy metals, and still have such a low avg. density? It's really incredibly disconcerting that so many people cling to this notion that invisible objects at the cores of galaxies are responsible for so much of the universe's mechanics. Can anybody explain how it is that this theory of black holes can ever possibly be disproven? The theory is just changed to suit the observations each time that a new enigmatic observation is made. Does anybody really think that this somehow represents the scientific method? What ever happened to theories which make accurate predictions? What ever happened to philosophy of science? Those who advocate ignoring a plasma-based cosmological explanation also ignore the implications of this approach: By permitting the assumptions of the conventional gravity-based theories to become unquestioned as the sole framework for interpreting observations, they are treating assumptions about the behavior of cosmic plasmas as unquestionable facts. LaViolette explains the phenomenon. Theory explains this, and much other., including today's NASA announcement of SN 1979c constant emission mechanism (It's not accreation!). Unfortunately, one must examine the body of evidence to overcome academic training predjudice. Try. It all makes sense. See MSNBC video. It is so nice to not be confused by old models that don't stand up anymore. Once again fails to answer a simple question.